With new leaves filling out the trees and the arrival of fresh blossoms, spring is a time of reawakening. The crisp air invigorates us after a long, cold winter, and we're ready to enjoy the warmth and sunshine. What better way to celebrate than with mouthwatering seasonal desserts. Think fresh spring fruits, pastels, and gorgeous presentations. Add one or more of these sweet and refreshing desserts to a special occasion menu or bake one just for fun! 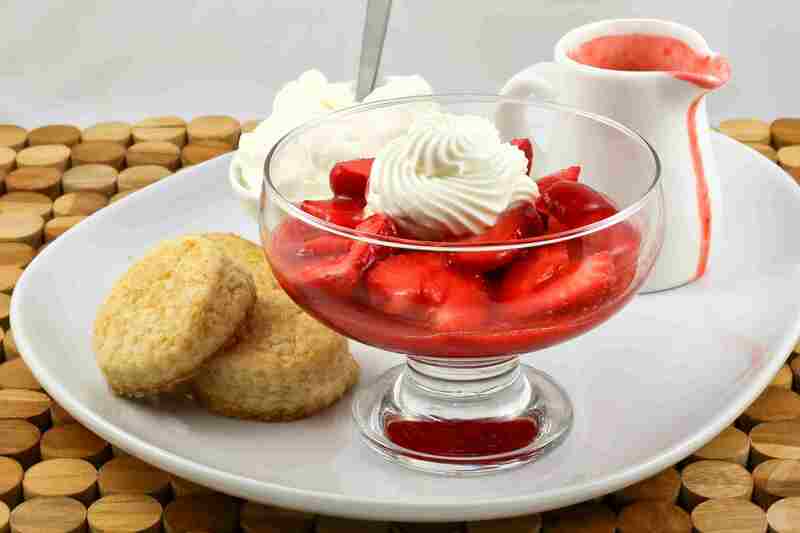 Delight your guests with a deconstructed strawberry shortcake. It's even better than the classic version! A light and delicate angel food cake is a fabulous dessert. Frost the cake with a fluffy frosting or top slices with lemon curd or fresh berries. It's an excellent foundation for a springtime dessert. What better way to celebrate the return of the hummingbirds than with this amazing hummingbird cake with cream cheese frosting! This cake has long been a favorite celebration cake. Pineapple, bananas, and pecans are among the ingredients. 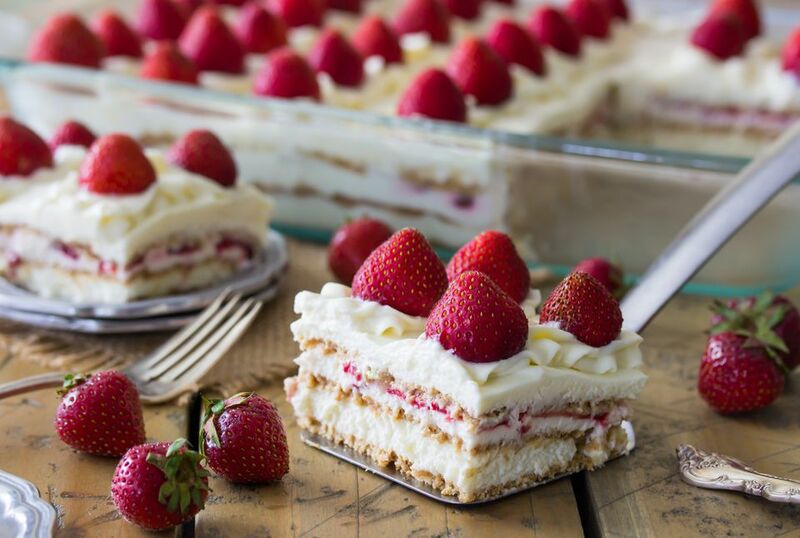 This fabulous no-bake strawberry icebox cheesecake tastes as good as it looks! It's hard to believe this scrumptious cake isn't baked. If you watch the Great British Baking Show (or Bake-Off), you've no doubt seen this elegant cake. Broaden your baking horizons with this authentic classic Victoria sponge cake recipe. This lemon crème brulée is an excellent choice for a party or special dinner. Creme brulée can be prepared a day in advance, an advantage if you're planning a big dinner party. Sprinkle the desserts with sugar and torch them just before serving. This creative dessert is a combination of cheesecake and baklava. The pistachio cheesecake filling is wrapped in honey syrup-drenched phyllo. If you're looking for an impressive dessert, you can't go wrong with this cheesecake baklava. Strawberries are one of America's favorite spring fruits. This easy strawberry cake with cream cheese frosting is a spectacular cake mix creation. Orange zest and raisins add sunny flavor to these traditional homemade hot cross buns. Crushed pineapple goes into the cake and the topping of this magnificent pound cake. The list of ingredients is not long, and this pineapple pound cake will earn you rave reviews! Bake this delectable cake with fresh spring strawberries and rhubarb. Serve it as a coffee cake for brunch or breakfast, as a dessert cake, or take it along to a potluck. The buttery crumble topping finishes the strawberry rhubarb crumb cake beautifully. This glorious dessert is made with layered meringues filled with sweet whipped cream. Top this meringue torte off with your choice of chocolate shavings, berries, or sliced fruit. Show off your baking skills with this stunning lemon pound cake. The finished cake is infused with sweet and tart lemon syrup. It doesn't need frosting, but feel free to serve it with a drizzle of lemon sauce or lemon curd. These yummy lemon cupcakes with lemon frosting are the perfect dessert for a spring event. Garnish the cupcakes with shredded or grated lemon zest for a beautiful presentation. Bake this blueberry buckle with fresh, early season blueberries. It's an excellent everyday snack cake perfect for a coffee get-together or breakfast. You don't have to be a professional baker to make an eye-catching dessert, but you might just fool your friends and family with this easy strawberry-rhubarb "fool." It's a ridiculously easy dessert made with fresh spring strawberries and rhubarb. This recipe for lemon fudge combines white chocolate with the bright and vibrant flavor of fresh lemon zest. This melt-in-your-mouth candy is a must for any spring fling. These pretty pastel lemon cream cheese bars are sure to impress your friends and family. A delicious shortbread crust made with brown sugar and pecans provides a crunchy base for these bright, cheerful bars. This classic lemon chess pie features blissful lemon flavor and bright, sunny color. And it's a surprisingly easy preparation. Bake it in a homemade crust or cut corners with refrigerated pastry sheets. Serve the pie with a dollop of freshly whipped cream and make sure to save some fresh lemon zest for garnish! Chopped strawberries and fresh puree are featured in these moist and colorful strawberry cupcakes. This classic rhubarb custard pie features a creamy rhubarb filling. Use homemade pie pastry or a frozen crust. Celebrate spring with this classic Southern favorite: homemade banana pudding. This homemade key lime pie with meringue topping is a delicious departure from the typical sweetened condensed milk and graham cracker crust pie. A fabulous lemon syrup flavors the ultimate lemon drizzle cake. Make it with or without ground almonds. No spring dessert list would be complete without a classic lemon meringue pie recipe. The tart fresh lemon filling is topped off with a fluffy sweet meringue. Bake this raspberry and blueberry bundt cake with the combination of blueberries and raspberries or use strawberries instead of raspberries. This fluffy, elegant meringue dessert gets its name from the ballerina Anna Pavlova. It's one of New Zealand's national dessert. Fill the center of the Pavlova meringue with freshly whipped cream and fresh spring berries. This scrumptious tres leches cake is a dessert with Latin American roots. The cake gets its name from the three kinds of milk used: evaporated milk, sweetened condensed milk, and cream. This pretty cake is basically an all-in-one easy strawberry shortcake. A cake mix makes it a snap to prepare. Mashed fresh strawberries make it a fabulous cake for a spring celebration. Garnish the cake with extra strawberries and a few mint leaves. Add this easy strawberry April Fool dessert to your spring party menu. Whipping cream and pureed strawberries team up in the dessert while Greek yogurt lightens the mixture and balances the flavors.